If you ask people what does software engineer do, you’ll probably get a quick answer. But when you ask what does QA do – well the answer probably won’t be that obvious. Quality is such a wide topic that it’s even hard to imagine one person able to handle everything. Still we can try to build a super QA hero that is able to face all the incoming challenges. Also as developers have their software craftsmanship movement, we will try to define quality craftsmanship rules we can follow to be ready for the future. 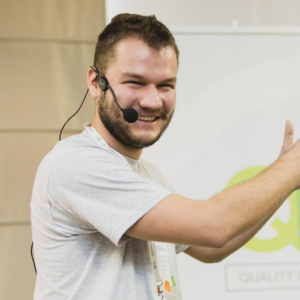 Tomek is a Public Speaker and Trainer, working also as Software Development Manager at Ocado Technology. He has 6 years professional experience working as a Software Engineer, Scrum Master, Agile Trainer, Leader and Manager. As an engineer, he is passionate about craftsmanship, propagating clean code, automated tests, behaviour driven development and domain driven design. As a leader, he helps to build an organisational culture based upon autonomy, collaboration and trust so that developers are equipped with both the hard and soft skills necessary to build truly awesome products. Tomek loves to change the reality around him. He his highly pragmatic, challenges orthodoxy at all levels and believes that there is always room for improvement. He is always eager to discuss and share his ideas.